But in July, she lost some momentum after succumbing to Brazil’s Istela Nunes by way of unanimous decision at ONE: BATTLE FOR THE HEAVENS. Despite the setback, she has always kept her eyes on the prize in the hopes of one day becoming the first female World Champion to emerge from the Philippines. 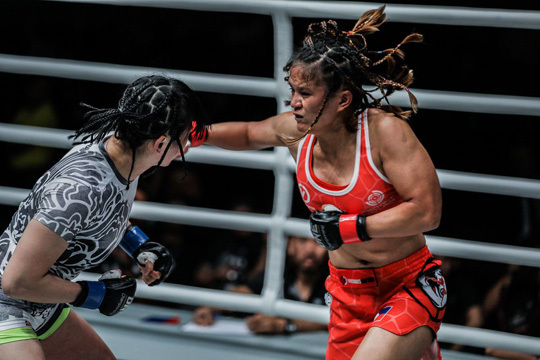 “I am still hoping to get a shot at the ONE Women's Atomweight World Title and fight Angela Lee,” Iniong admitted. For her to bring that particular dream to life, she needs to defeat Radzuan — an unbeaten rising star from Malaysia. Iniong has been working diligently at Team Lakay in an effort to fine-tune her skills and enter the match-up at the top of her game. "I am working doubly hard in training by pushing myself to the limits,” she explained. "I follow my coaches' advise in every turn. We focused on my weaknesses in training and gave a lot of time on my ground game.